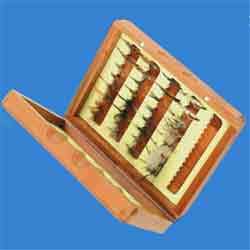 Turralls presentation Stillwater Essentials fly selection of 32 flies is a series of fishing flies presented in Turralls handsome bamboo pocket sized fly box crafted from mellowed split cane. The fly box has slotted foam inserts which will securely hold trout and salmon flies. Brass hinged with magnetic closure this beautiful box is lightweight and floats - almost too nice to take fishingEach Stillwater Essentials fly is carefully selected from the award winning range of Turrall flies which will offer a balanced choice of essential flies to match seasonal hatches and regional requirements.Picture for illustration only.